Take A Dip In Our FAQs. Ok, so we’re not quite on the border, but just north of Dallas, TX in Carrollton. Where can I get coupons for On The Border® products? At On The Border® we like to make things easy, so our products are periodically offered on discount or promotion at retailers across the country. Though we don’t currently offer coupons online, check your local store for great deals on our chips and dips. Where is the expiration date/batch code on my product? Each one is stamped with an “enjoy by” date that applies to unopened products. For SALSA OR QUESO you can find it on the curved part of the jar between the edge of the label and the lid; For CHIPS, it’s printed on the upper right corner of the bag; And for DIP CUPS, look to the side of the cup, just below the lip. This date is a recommendation only and should be considered in conjunction with how long the package has been opened. 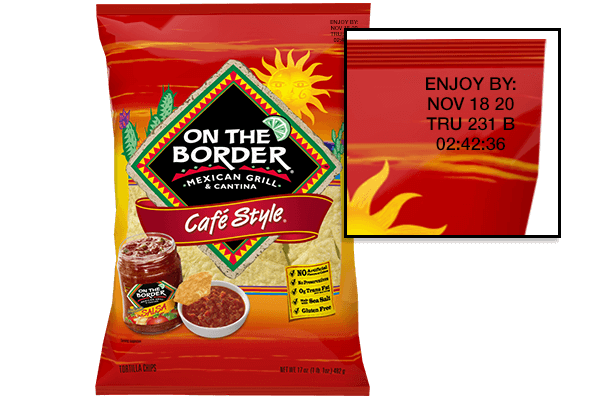 The On The Border® product in my pantry is past the date printed on the package. Is it still safe to use? While we encourage you to relax and enjoy our food as slowly as possible, our products are labeled with an “Enjoy By” date for unopened products to ensure food safety and delicious taste. 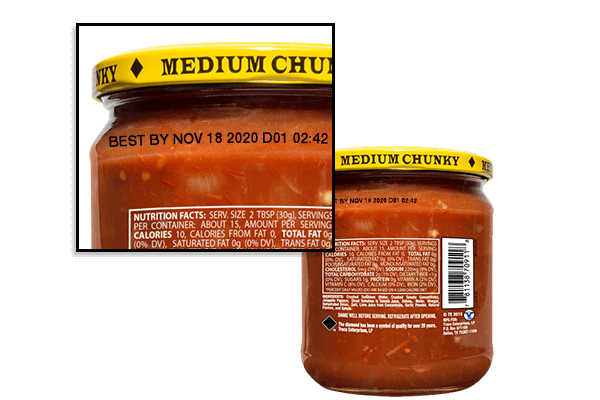 We guarantee all unopened products through the labeled shelf life and recommend that you consume them before the printed date for optimal freshness and flavor. How long will my jar of salsa/queso stay good after I open it? Our salsas are made with passion, NOT preservatives. So we recommend using all jarred dips within 10-14 days after opening (But if you’re anything like us, you’ll eat it all in one sitting). Once a jar has been opened, the shelf life may vary based on the temperature of your refrigerator, exposure to air, and other factors beyond our control. Keep salsa and queso at their freshest by pouring what you need into a bowl, reclosing the jar tightly, and refrigerating it promptly. Our single-serve salsa & queso dip cups are meant to be consumed in one sitting and are not resealable. If you wish to save leftovers for another snacking session, we suggest that you transfer any remaining dip into a resealable container, refrigerate it promptly, and consumer within 2-3 days. Can On The Border® packaging be recycled? Thanks for sharing your enthusiasm for recycling! We are constantly looking for ways to reduce our environmental impact and help our consumers do the same. CHIPS: Most chip bags, including ours, aren’t yet recyclable. However, at Truco we are always looking for ways to reduce our environmental impact and evaluating the best options available to do so. SALSA OR QUESO: Yes! Glass jars can be recycled in most areas. Check with your local provider for their specific requirements. DIP CUPS: Yes! Chunky Salsa and Queso Dip single-serve plastic cups are recyclable in most areas. Check with your local provider for their specific requirements. Where can I purchase On The Border® products? It’s easy! Take a look at our product locator, which shows stores by ZIP code that carry your favorite OTB products. Why doesn’t my local store carry all of your chip/dip flavors? We strive to bring life on the border to as many places we can. But it’s up to the store buyer or manager at each retailer to determine which stores will carry which products. Often stores have limited space for our brand and only choose to carry a few select items. If you don’t see your favorite product, ask the store manager if it can be special ordered for you. We like to make food that everyone can enjoy, so our salted tortilla chips, salsas, and Taste of Tajín® flavored products are made without animal-derived ingredients, making them vegan-friendly. No products are currently certified Vegan. Do On The Border® products contain GMO (genetically modified, GM, GE) ingredients? We’re proud to make several products that are Non-GMO Project verified. Our On The Border® Organic Yellow Corn Tortilla Chips, and Organic Blue Corn Tortilla Chips are certified organic, are Non-GMO Project Verified, and taste great! Our Chunky Salsa is Non-GMO Project Verified. Our Organic Chunky Salsas and Organic Purple Corn Tortilla Strips are not yet Non-GMO Project Verified, but are certified organic and are made without GMO ingredients. Learn more about the Non-GMO Project and their verification activities at www.nongmoproject.org. Where can I find Nutrition Facts and ingredient lists for On The Border® products? Just check the back of the package for the most up to date information. We’re also working hard to update our website with nutrition and ingredient data to make things extra easy. Are On The Border® products made in the USA? Where do the ingredients come from? Several facilities across the United States manufacture products for us according to our exacting quality standards. No products are manufactured outside the USA. Our ingredients come from all over the US, with a few exceptions that are supplied by trusted ingredient partners. Does _____ contain allergens? I’m allergic to _____. Some of our products do contain allergens. But relax; we clearly list any allergens present in each product’s ingredient statement. Be sure to check the package of your favorite product for the most current information so you can enjoy it without worry. Always consult your healthcare provider if you are uncertain whether a product is suitable for your particular needs. Are On The Border® products manufactured on shared equipment with peanuts or other allergens? On The Border® products are made with ingredients that do not contain peanuts. Some of our manufacturing facilities do handle peanuts and other “Big 8” allergens and may run these on equipment that is also used to make our products. Please be assured that we require them to follow strict allergen control programs and meticulous testing procedures designed to effectively manage these allergens. Be sure to check the package of your favorite product for the most current information so you can enjoy it without worry. Always consult your healthcare provider if you are uncertain whether a product is suitable for your particular needs. Are On The Border® products gluten free? Is there a chance for cross-contamination? Yes! All of our On The Border® retail products are gluten free. Our products must pass finished goods testing to meet FDA requirements for gluten-free labeling, and we prominently state “Gluten Free” on our packaging. Certain products are certified as Gluten Free by the Gluten Intolerance Group - look for their seal on those products. Are your chips baked or fried? Both! Our tortilla chips are baked then fried to achieve a great flavor and crispy texture. Do you have a low sodium chip? Right now, we don’t make a chip that meets FDA guidelines for a low sodium claim. Our lowest-sodium tortilla chips are our Café Style, Rounds, or Fiesta Dippin’ Chips, with 115mg of sodium per 1oz serving. Is your Queso (Salsa con Queso, Monterey Jack Queso, Queso Dip Cups) made with pasteurized cheese? Our Quesos are made using pasteurized cheeses and a process that heats the cheese to a temperature that’s even higher than the pasteurization process. Always consult your healthcare provider if you are uncertain whether a product is suitable for your particular needs. Does your Queso (Salsa con Queso, Monterey Jack Queso, Queso Dip Cups) contain animal enzymes? To the best of our knowledge, the cheeses used in our Quesos are made using non-animal-derived enzymes. Chunky Salsa Cups & Queso Dip Cups look/taste different than the product in jars. Why? These products are made using a different cooking process than our dips in jars, so the recipes are slightly different. But since all our products are made with the same high quality standards, why not try both jars and cups? Can I freeze your dips? Freezing is a safe way to extend the life of dips but may affect the quality of our salsas and quesos, specifically the texture. If you decide to freeze product, we recommend transferring product to a non-glass freezer-safe container to avoid shattering during the freezing process. Are Nacho Cheese/Zesty Ranch chips spicy? If you’re not feeling fiery, these flavors are among our mildest. Are Taste of Tajín® chips spicy? What chile peppers are used in the Tajín® seasonings? Each variety of Tajín® seasoning is made with a blend of chili peppers, sea salt, and lime juice. Our Taste of Tajín® Clásico Chili & Lime chips contain a mild blend of chili peppers, while Taste of Tajín® Chipotle & Lime chips are made with smoked jalapeño peppers that have a higher degree of heat. I found a bucket of drink mix in my pantry/in my freezer and I don’t know how old it is. Can I still use it? Drink mixes were last manufactured in 2014; and the shelf life of these products was 1 year. We do not recommend using these OTB drink mixes, as they may no longer meet our quality standards. I have a great idea for a new On The Border® product! How can I submit it for consideration? While we do love great ideas, we decided many years ago to adopt a corporate policy of not accepting unsolicited ideas from outside the company. We hope you’ll understand and continue to enjoy the new products that our Product Development team creates with you in mind! Why don’t your chips/dips taste like they do at the On The Border® restaurant? Due to different manufacturing processes, restaurant items and packaged products sold at your local retailer are not exactly alike. Each On The Border® restaurant creates menu items daily for onsite consumption, while the On The Border® products available at retailers across are made with longer shelf life in mind. However, We do like to think that they are both equally delicious. How do I share a comment about my On The Border® restaurant experience? Truco Enterprises, LP manufactures and distributes On The Border® products at chain retailers. On The Border® restaurants are a separate entity, and all inquiries and feedback regarding the restaurant can be directed to their website: www.ontheborder.com/contact or by calling 1-888-682-6882. Hungry for more? Contact Us with any other questions you may have.